As an alternative to the more common chain final drives, shaft final drive offers distinct advantages and disadvantages that must be considered when designing a motorcycle or ATV. Shaft drive is a clean, quiet, low maintenance and extremely reliable method of driving the wheel(s), but it is heavy, expensive and virtually impossible to change final drive gear ratios, except on BMWs. 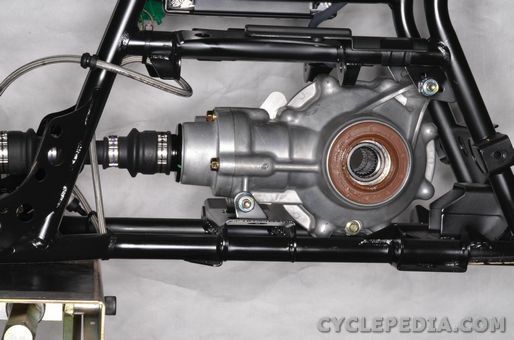 Shaft final drive is used primarily by touring motorcycles, cruiser style motorcycles (favored by Yamaha in particular) and workhorse ATVs. BMW used shaft final drive exclusively until the introduction of the F650 series. The only periodic maintenance required for a shaft final drive is occasional changes of the final drive gear lube. The intervals for these gear lube changes are quite long, and many shaft driven motorcycles and ATVs never have the lube changed, with no adverse consequences! A conscientious owner will follow the manufacturers’ recommendations, however, as outlined in the Periodic Maintenance Chart in the owner’s manual and service manual. When changing final drive gear lube, warm the final drive assembly by riding the vehicle for at least 20 minutes. This will allow the old gear lube to drain out quicker and more completely. 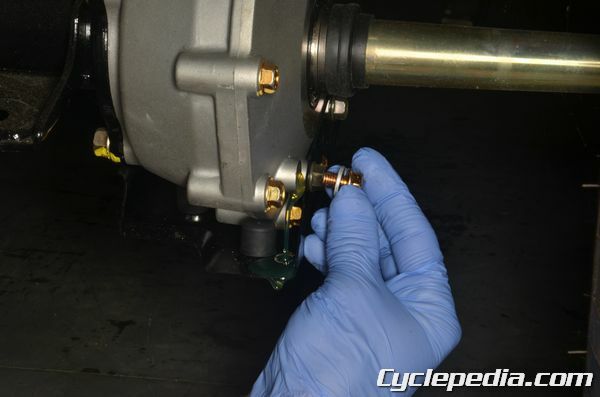 Always follow the manufacturers’ recommendations as to the type of gear lube required, but generally it should be a Hypoid (high pressure) type gear lube of either 80 or 90 weight. 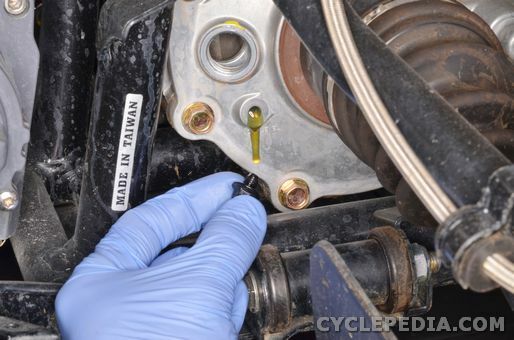 After draining the old gear lube and reinstalling the drain plug, fill the final drive with new gear lube up to the bottom of the filler opening threads or to a check bolt hole as shown, which is almost always a horizontal hole in the side of the final drive housing. Install the filler cap and you’re done with maintenance for quite some time.